Rex Hoggard reports that new U.S. Ryder Cup captain Steve Stricker has spoken to Patrick Reed and all has been handled with regards to the Masters champion. Yes he does! Wielding a large knife from behind if 2018 is any indication. Tiger Had A Long Air Clearing Conversation With Patrick Reed, Lucky Him! From Dan Kilbridge’s Golfweek story. Who says Tiger doesn’t earn his free Ryder Cup and Presidents Cup gear! I guess that means we won’t get a new task force to investigate the 218 Ryder Cup communications breakdown alleged by Reed. Darn. Patrick Reed’s Point Misser World Tour landed in the Bahamas and he opened his set with a stirring rendition of that greatest hit, Captain America And The Three-And-O Cowboy. Rex Hoggard at GolfChannel.com reports that Reed was asked if he still felt like “Captain America” after his 2018 Ryder Cup struggles. “No, still 3-0 in [Ryder Cup] singles,” Reed said. I’m feeling a new ad campaign: 3-0. Maybe a big 3-0 on the golf bag or on the hat or the back of his shirts? He does have a ways to go if he wants to make the all-time singles points list, not that such things matter. Francesco On Ryder Cup: "We saw that they were probably more tired than we were"
Golf Digest Italy’s Massimo De Luca files an enjoyable Q&A with Open Champion Francesco Molinari and he talks all things 2018, his incredible breakout season. Regarding the Ryder Cup, where he went 5-0, Molinari confirms that the Europeans spotted FedEx-fused fatigue when asked why the Europeans excelled. It’s difficult to pinpoint a specific reason. Undoubtedly the tricky setup of the course was a huge factor. But don’t forget, we lost all three of the first matches on Friday morning. If it hadn’t been for Tommy Fleetwood and me beating Woods and Patrick Reed, we would have been at 0-4, and it would have been really hard. We reacted by winning, 4-0, in the afternoon. But we didn’t kid ourselves. The more-experienced players worried about an American backlash, but with time we felt better on that course, which many of us know [as an annual European Tour stop for the French Open]. The key moment was Saturday morning, when only Justin Thomas and Jordan Spieth had earned a point. We saw that they were probably more tired than we were, also because the majority of them had been busy with the FedEx right up until the end. But you know how the Ryder Cup is. In fact, after the 2-2 Saturday afternoon, they attempted a comeback in the singles on Sunday. But we reacted well. The Guardian’s Sean Ingle considers analytics in sports and, in particular, the role played in Europe’s victorious 2018 Ryder Cup. 15th Club’s influence continued in Versailles, with analysts suggesting the ideal fourballs and foursomes pairings for every player based on the format, their strengths, and the course layout – which included the strong recommendation Francesco Molinari and Tommy Fleetwood should play together. Crucially they also had enough of Bjørn’s ear to reassure him and his vice-captains to “stick to the plan”’ on the first morning when Europe were about to go 3-1 down and were considering last-minute changes to the afternoon foursomes. As Wooster relates: “This was a critical moment, and one where all those months spent establishing relationships and trust came to the fore. We knew the foursomes was a very different format and our statistical simulations gave us a high level of confidence the afternoon would be ours.” Bjørn listened and stuck to the plan. Europe won the session 4-0 and never looked back. Golfweek’s Eamon Lynch reports on the red-hot rumor mill that had players gossiping in recent weeks about a positive test result at the Ryder Cup. Lynch explains on the surprise (Bonjour!) test administered at the team hotels by France’s AFLD, still smarting from the Tour de France issues over the years. “All the results are in and there were no positive tests,” said Maggie Durand, a spokeswoman for the World Anti-Doping Agency (WADA), to which the French AFLD affiliate reported its findings. When asked about the method of testing, WADA confirmed it was urinalysis. And about the players tested? In the event of a negative test, public disclosure is up to the athlete, WADA echoed. But drug testing is golf’s third rail that no one wants to touch. That was apparent when I asked managers for every Ryder Cupper if their man had been tested. Even a clean slate of negative results didn’t encourage transparency among the tested. But it was interesting to see who responded to Lynch about even being tested at all. In the end, managers for just four of the 24 Ryder Cup players were willing to directly address the events of that Tuesday evening in Paris. Representatives for Tommy Fleetwood and Thorbjorn Olesen said that neither had been asked for a sample. Agents for Rory McIlroy and Ian Poulter confirmed they were among the eight men tested. From Brian Wacker’s GolfDigest.com story on how the captain and assistants continue to mull what went wrong. Not obtaining Justine Reed’s Twitter and Facebook passwords and changing them? Too much Polo in the uniforms? An imbalance of plain, almond and chocolate croissants in the team room? 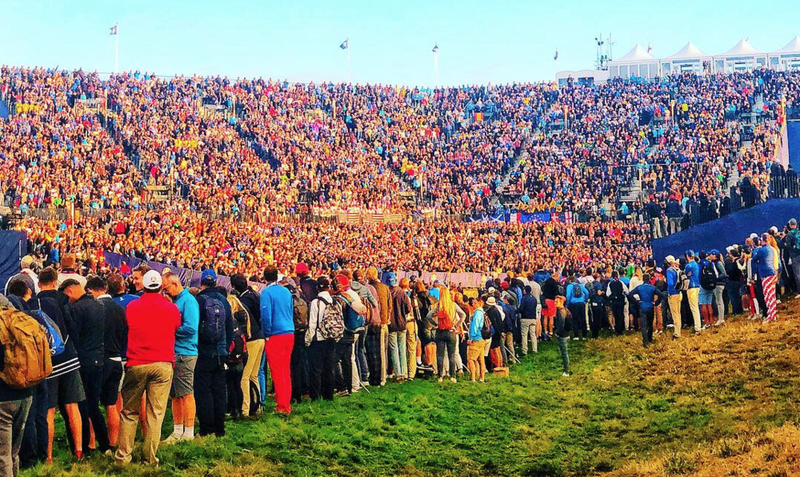 European Tour: Thanks For Nothing France! So they put on a wildly successful Ryder Cup (well, until the apparently epic disaster that was the Monday-after outing…) and all France now has to show for helping Europe take back the cup? An October, non-Rolex Series event in a wasteland when stars will likely gear up for the Race to Dubai. That was the buried lede from the 2019 schedule announcement where the Sistine Chapel of Ryder Cup venues—if you listened to Euros the last six years—did deliver in many ways and gets downgraded within a month of hosting the biennial team matches. From an admittedly shaky English translation of an unbylined AFP story where the word “degraded” is used to describe the move. The Open de France loses its importance. It's official, the tournament will no longer benefit from its status of "Rolex Series" next year. Moreover, it will not take place in June but in October, from 17 to 20. Title sponsor since 2017 for a period of at least three years plus two years in option, the Chinese tourism group HNA, entangled in serious financial problems, has failed the organizers several months ago. The replacement of Alstom had allowed the Open de France, oldest tournament in continental Europe, to integrate the eight "Rolex Series", the newly created category grouping the most prestigious competitions of the European circuit. How quickly—and I mean quickly—they forget. Should Captain's Be Allowed To Control Cup Courses? Paul Azinger brought up this question when discussing the 2018 Ryder Cup with the Morning Drive crew, noting that he was the first American captain in the modern era to influence setup. He said it’s been more of a European tradition to meddle and suggested that Captain Thomas Bjorn exploited the U.S. strength. But the most interesting point: Azinger now agrees with Jack Nicklaus’ view that Captain’s shouldn’t have control over the setup. While a sportsmanship element certainly seems undermined by course setup gamesmanship, and the 2018 Le Golf National presentation was just plain silly, I think the event is more interesting when the home team attempts to shape the course to their strengths. The move can easily backfire. But since the Ryder Cup seems determined to avoid genuinely captivating match play architecture with strong risk-reward holes, course setup ploys add intrigue. Is he a Hard Brexit guy or more of a Soft Brexit type? 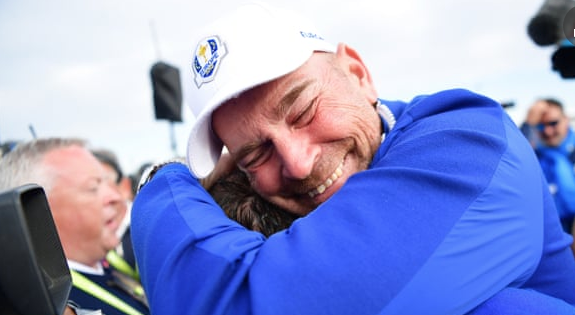 Given that he gets a standing ovation these days for walking to a first tee en route to an inevitable round starting in the 70s, the Captain Thomas Bjorn lovefest is now hitting full stride. Comparisons to Churchill seem inevitable. Alistair Tait of Golfweek on what the victorious 2018 Captain is planning now that he managed to craft winning lineups, drive his buggy without injuring a spectator and keep his players from bad mouthing their week. Oh, and he’s not pulling the I-told-you-so-card on his Sergio selection, as he’s entitled to do. Take the Dane’s “controversial” decision to select Sergio Garcia as one of his wild-card picks. Bjorn was pilloried from all points – including this one – for picking the out of form Spaniard. If Bjorn had any reason to say “I told you so,” this was his opportunity. Instead, he took a dignified stance. “I’m not one to sit there and say I told you so, because Sergio could have showed up and not won points,” Bjorn said. “He could have played well and lost matches. That happens in the Ryder Cup. Now, I’m happy the Europeans are enjoying this victory, but as we discussed on Morning Drive, the excessive celebration flags are about to start flying. Peter Kaufman restructures distressed assets as an investment banker and takes a businessman’s approach to America’s latest Ryder Cup rout in Europe. In it he spawns a spectacular phrase that will make Patrick Reed happy, assuming he reads MorningRead.com. 1. End crony captain-ism. Let’s stop the parade of old PGA Tour players as captains. No more, Whose turn is it? Or, Which of my buddies do I want to hang around with in Paris? I hate to pick on U.S. captain Jim Furyk – he seems like a nice-enough fellow – but he is the most recent glaring example of what needs to change. Furyk chose his pals Phil Mickelson and Tiger Woods as captain’s choices, and it’s clear that they had huge influences on everything Furyk did, or did not do. They are a combined 90 years old (really). They also are ranked Nos. 1 and 2, respectively, in the category of Most Ryder Cup Points Lost in History. But they are “very experienced”! Very experienced at losing, actually. The definition of insanity is doing the same thing over and over again, and expecting a different result. Their losing Ryder Cup scar tissue has scar tissue on top of scar tissue. They just do not play nicely with others. That is not a recipe for success. Enjoy it, savor it, hype it a little, but a MoliWood signage build out at the British Masters when your tour is in the red? Too much! The Golf Gods will note this. With Justin Thomas backing USA captain Jim Furyk’s assertion that 2018 Ryder Cup couplings were decided and communicated well in advance of the matches, Patrick Reed’s complaint of Jordan Spieth separation-frustration took another hit. That will not be an issue again until he makes the next American team, potentially as soon as 2019’s Presidents Cup in Melbourne. But until then Reed will be the villain and Eamon Lynch says that’s a good thing for golf. And now back to the mysterious saga of Dustin Johnson and Brooks Koepka in 2018’s huge box office dud, Venom In Versailles. And while Furyk reiterated the close relationship between the two friends, he also seemed to imply that some sort of incident, however minor, did occur. "Whatever altercation started, or what happened, it was very brief. It was very short. Neither one of them really took anything out of it," Furyk said. "They're like brothers. Brothers may argue, brothers get into it. But they're as close as they've ever been, and it really had no effect on either one of them." Whatever altercation started what happened was very brief and was very short. Neither one of them really took anything out of it. In fact they both hopped in a cab not long after that and went out together for a little while, woke up in the morning like nothing happened. So in their minds it was a non-issue and really like they are like brothers. So brothers may argue, get into it, but they are close as they’ve ever been. I can attest that Versailles on a Sunday night is as about as wild and crazy as it gets on the nightlife front. There are both Uber and taxi drivers out and about. So I’m sure Brooks and DJ had the time of their lives fleeing the European team celebration. Still, such a detail suggests that claims of media-conjured news appear inaccurate. At least, if Jim Furyk is to be believed. "Now, the Americans need to copy Europe one more time and learn how to lose with grace, dignity and class." Tough stuff from John Feinstein directed at Team USA following the Ryder Cup and especially toward Phil Mickelson, a future captain. If you look closely at what the Task Force did after the 2014 matches it really came down to this: It recommended copying everything Europe had been doing for years in terms of selecting captains and vice-captains and took the selection of the captain out of the hands of the PGA President and put it into the hands of the players. Now, the Americans need to copy Europe one more time and learn how to lose with grace, dignity and class. 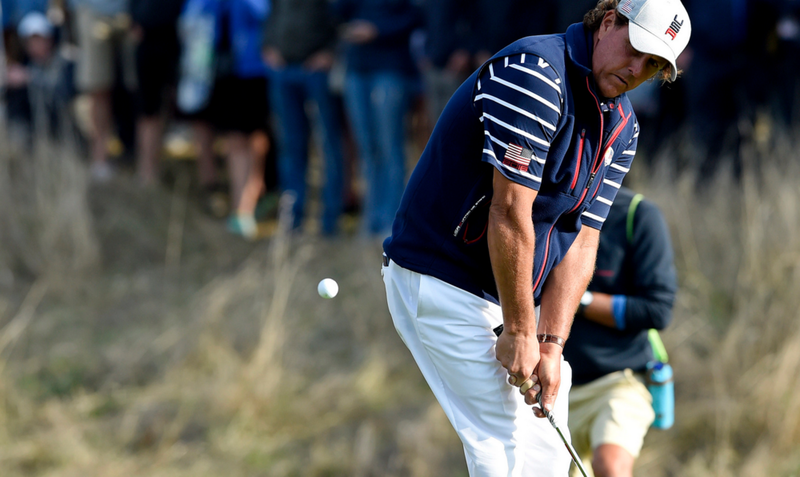 Being bad losers is the one aspect of the Ryder Cup the Americans seem—sadly—to have mastered. There is much to unpack in Jim Furyk’s sitdown with Golf Channel’s Tim Rosaforte, from the Captain’s Patrick Reed pushback to the state of the Bash Brothers to Phil Mickelson’s bizarro last minute swing mechanics tune-up explaining his appearance in foursomes play. Ever the gentleman, Furyk is at least starting to admit a few things related to the 2018 Ryder Cup. The first big ticket item: Reed had no reason to suggest surprise, shock or secrecy in getting a coupling with Tiger Woods and had nothing to do with Reed’s claim of a Jordan Spieth-led conspiracy to avoid him. Instead, things changed when Tiger went from cart driver status to player, creating two super-teams (on paper anyway). "When I started looking at who (Tiger) would pair well with, I kept coming back to Patrick Reed," Furyk said. 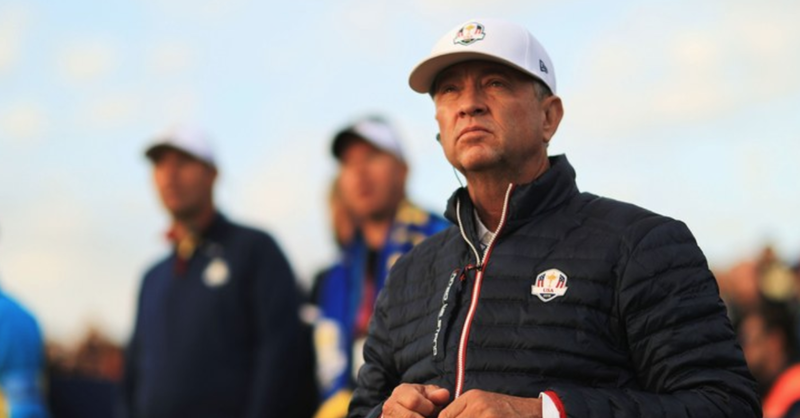 "There was always the idea that we could go Tiger and JT (Justin Thomas), and Patrick and Jordan, but ultimately they knew going into the week, weeks in advance, they knew they would start the Ryder Cup with Patrick and Tiger being partners." Furyk even noted that he’d consulted on his original idea of leading off with Reed/Woods and Reed suggested they go out later the first morning. ORLANDO, Fla., (Oct. 7, 2018) – U.S. Ryder Cup captain Jim Furyk sat down with Golf Channel Insider Tim Rosaforte in Jacksonville today for his first extended interview since the U.S. team’s return from the Ryder Cup in Paris. The interview will air Monday on Morning Drive (7-9 a.m. ET) and again Monday night on Golf Central (6-7 p.m. ET). After his Safeway Open second round Phil Mickelson made clear he’s going to play less in 2018-19. Reason one, as reported by PGATour.com’s Cameron Morfit, centers around fatigue and managing his energy levels as a 48-year-old. Let’s put the breaks on here for a minute. I don’t recall many 14 to 16 yard wide areas in the main landing areas, or anything under 20 yards. I paced off about 10 landing areas and the Europeans generally gave one are of width, though they also engaged in chintzy (perfectly kosher) tactics of rolling an area like the left side of the first fairway to reduce a swatch of 30 yards to effectively playing 25. Here’s where Mickelson and Team USA do deserve some credit: the setup was structured so that an extremely errant drive—except down across the 7th hole OB as Patrick Reed found out—could find the spectator areas. They very easily could have taken tee shots on multiple holes at the chalets and spectator areas well off play, taken a free drop on the hardpan, and shown up the European setup. Thankfully, they did not in the interest of sportsmanship and given the horrible injury suffered by a spectator. The second point by Mickelson is a gift. For those who have explained how distance gains are a burden on golf courses, he effective explains how more width is needed to accommodate drives over 300 yards. More width means more acreage for turf, more acreage means more cost. He certainly is wise to schedule that way. "Eleven players understood the concept of team golf and only one didn’t." The New York Post’s Mark Cannizzaro talked to a player identified as a Team USA member after they returned from France and we learned several things about the strife. 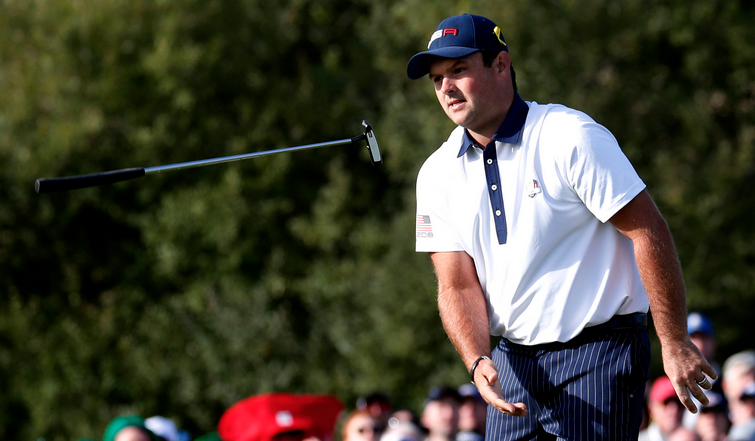 —Patrick Reed is viewed as having begged his way into a Tiger pairing. —It’s probably a really good thing the charter did not have WiFi, otherwise we might have had an in-flight fight. At least Bubba has something to be happy about. He’s in the group of 11! French publication L’Equippe says Dustin Johnson and Brooks Koepka were rowing on the team flight from Atlanta to Paris. 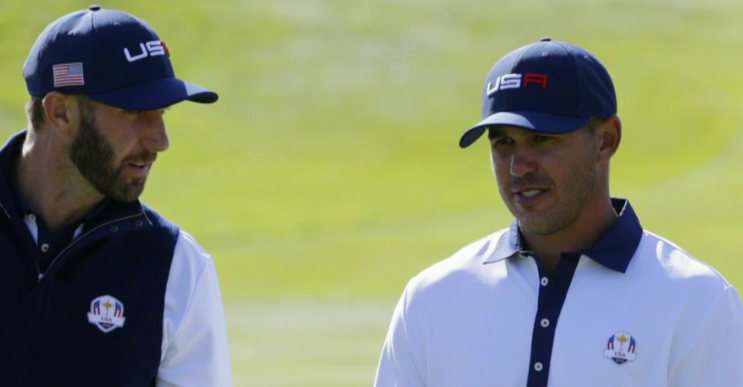 Now James Corrigan reports for The Telegraph that DJ and Koepka, aka the Bash Brothers who’ve bonded over dead lifts sound like they are dead to each other after having to be separated Sunday night following the 2018 Ryder Cup. Witnesses recounted how the pair almost came to blows after they had been invited into the Europe team room, a few hours after the resounding home success at Le Golf National. The reason for the bust-up was not known, but it was a huge ­surprise as they are regarded as best friends. You know the old saying: what happens in the team room stays in team room, unless it’s the other team’s room. Koepka’s agent Blake Smith says the story is made up, reports GolfDigest.com’s Joel Beall. Somewhere right now Tom Watson is smiling and Steve Stricker is wondering if he really wants the 2020 captaincy.